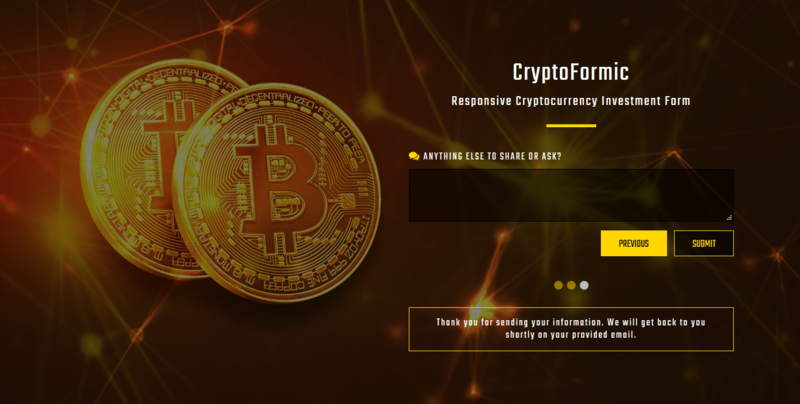 CryptoFormic is a Multistep Responsive Cryptocurrency Investment Form. This form will be a perfect choice for all Cryptocurrency based websites. If you are developing a website for Cryptocurrency Industry and looking to integrate a form so that potential customers can apply for investment, then this form is for you. It’s Bootstrap based PHP form with Ajax support. It can be easily customized as it is well documented and developed using latest web technologies. AJAX Enabled (no page reloads). Note: All images are used for preview purpose only. They are not included in the final purchase files. But Placeholder images are added so you can easily see the image size and replace them with yours. If you need any technical support, please send us a message via our profile page and we will get back to you as soon as possible.